In deciding on a cake flavor to make, I wanted to do something that everyone would enjoy. That being said, vanilla is a popular choice. To kick it up a notch, I made a French Vanilla cake which I thought had more flavor that the usual vanilla, white or yellow cake. The cake had a tender crumb that was perfect - not too dry, not too moist... just right. For the filling, I took a hint from Suzanne when she mentioned Josh was a fan of raspberries. I made a raspberry filling that was delicious and allowed me to take advantage of the fresh raspberries in season too. The cake was covered with a traditional buttercream frosting. 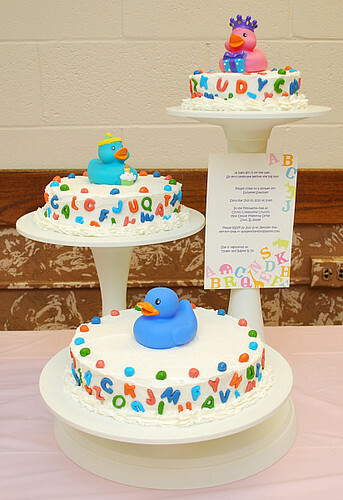 For the decor, I used their shower invitation as inspiration and mimicked the alphabet theme onto the cake. The alphabet letters were made by making a homemade marshmallow fondant and using small alphabet cookie cutters especially made to use with fondant. I colored the fondant with color gels to get the right color to go with the invitation and cake toppers. 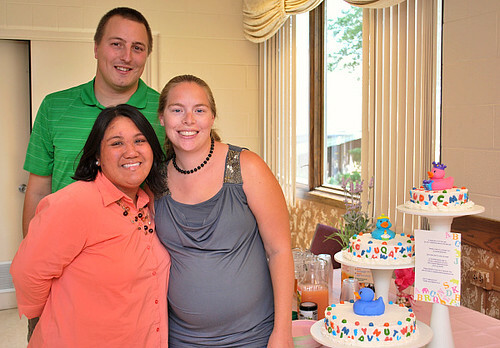 The cake toppers were the only inedible part of the cake and were chosen by Josh. This cake definitely was a hit at the party and compliments were given all around. If you're looking for a show stopper cake, this is one I'd definitely recommend. Preheat oven to 350 degrees. Prepare your cake pans by greasing & flouring them; set aside. Pour the batter into your prepared pans and divide evenly between the 2. Bake in the preheated oven for 20-25 minutes or until a toothpick comes out clean. In a small bowl, place 1/2 cup of fresh raspberries and set aside (if using frozen berries, skip this step). In a large saucepan, place the remaining raspberries along with 1 1/4 cup of water, sugar and lemon juice. Bring it to a boil and allow to cook, stirring the berries occasionally. They'll eventually break down in about 10-15 minutes. Remove from heat and strain the berry mixture through a fine mesh strainer to remove the seeds. Place the mixture back into the saucepan over medium low heat. In a small bowl, prepare a slurry by combining the remaining 1/2 cup of water and the vanilla with the cornstarch. Pour this slurry into the saucepan with the strained raspberry mixture. Mix well over medium low heat until it starts to thicken. Remove from heat and set aside to cool completely. Split each cake in half crosswise. Place a dollop of buttercream frosting on the center of your serving platter and top with one cake half. (This keeps the cake in place and prevents it from sliding.) Pipe buttercream frosting on the edge of the cake. 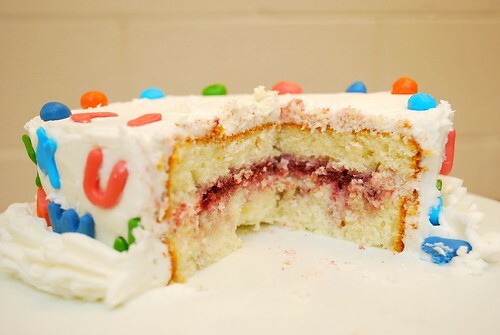 Fill the center of the cake with the raspberry filling and then top with the other cake half. Frost the entire cake lightly for the 'crumb coat' which seals everything in. It doesn't have to be perfect and crumbs are completely fine, as the cake will be frosting a second time for a final finish. After the crumb coat, frost again liberally as desired. Repeat with the other cake. Decorate the cake as you wish. Grease microwave proof bowl w/ Crisco. Also grease wooden or heat proof spoon. Pour marshmallows and water into bowl. Microwave for approximately 2 minutes stopping and stirring at 40 second intervals. Mixture should be soupy. Take out of microwave and immediately add corn syrup, lemon juice, salt and extracts. Stir well. Sift confectioner’s sugar into mixture, one cup at a time. After approximately 5 cups, grease your hands well with Crisco and knead the mixture in the bowl. Add the sixth cup and continue to knead. Now grease your work surface well and turn mixture out of bowl onto counter. Sift remaining sugar, regrease hands, and knead well. If mixture seems soft, add one additional cup of powdered sugar. *APPLAUSE* Wow. The cake looks wonderful!! You did a fantastic job. Aww!!! Look at your cakes...gorgeous!!! !